Fifteen books, one awesome price, and now with Movement 3 duets included! 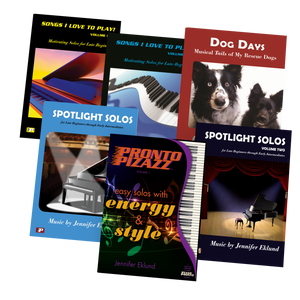 The new Piano Pronto Teacher Starter pack includes all nine student books, five teacher duet books, and the theory workbook. Books included: Nine student method books, the theory workbook, and all five teacher duet books. It was so exciting to dive into the Piano Pronto series. I sat down and played through all the books. I enjoyed playing through all of them--started driving my kids crazy! I love the progression of the books. The song selection has familiar classics. 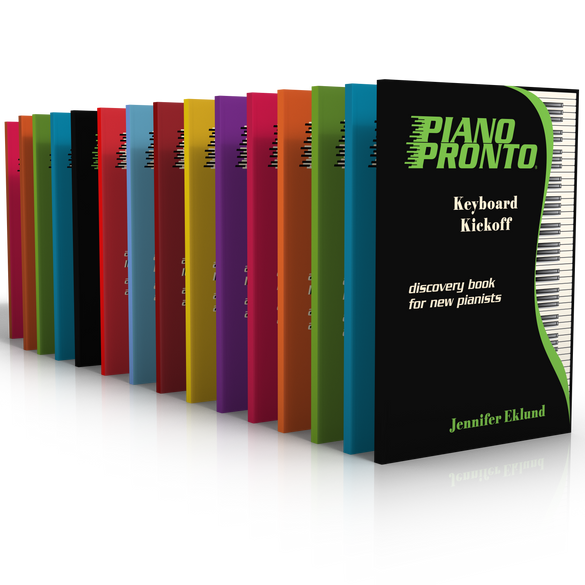 I have been using the Piano Pronto method books this last year and have really enjoyed it. The students like it too. They seem to move faster in difficulty and enjoy recognizing the songs. The books came quickly and would highly recommend them to anyone. I started the Piano Pronto method books less than a year ago . I love the familiar songs and larger print for easier reading. The teacher duets are so much fun for teachers and students . No more oompah arrangements! My June recital was a huge success with mostly beginners because even the younger ones sounded great with the duets parts. I love that I can listen to the music first. I have switched all my students over to Pronto because parents and kids are equally thrilled with it. It has iquadrupled my student load in the past year! I am so grateful for discovering this method by chance through Facebook! I switched all of my students over to Piano Pronto books last year, and I noticed that all of their other books disappeared. They really love all the songs in these books and they relate to the melodies. I notice that my new students this year have quickly become intermediates, due to more practicing and more enthusiasm for Jennifer's music! And I find myself practicing more because I love her style of writing. She writes beautiful duets for us so that we can be a big part of our students' learning experience. I highly recommend this entire group of books to every piano teacher. My sister-in-law told me about the Piano Pronto books, and how her child who was not thrilled about learning piano now likes to play because of these books. At this same family gathering, my niece, whom I teach piano started playing these books and had her mother take a photo of the cover to see if she could get them, only to find out I also wanted to order them. After playing through some music, I'm hooked. The arrangements are beautiful, and I didn't want to stop playing the teacher accompaniments. An added bonus I didn't expect, was that my other child asked if she could play the student part on her violin--method books and violin solo practice in one. I'm excited about how quickly they feel like they are playing "real music". I have been teaching piano for over 30 years. I have been using this series now for a few years and it is magic. My students love the familiar songs, and the duets are beautiful and very motivating. The series is very flexible and I find it works well with every type of student. I included several songs from the series on my recital this year, including duets, and it was by far the most successful recital I have had. You will love teaching from these books! I also now have a full studio with 7 families on a waiting list. My students love this method! I really like Piano Pronto series! As a teacher I’m very careful about arrangements and Jennifer did a wonderful job making wellknown simplified tunes appealing and pleasing for beginners! Also I like that she incorporate a lot of patterns in songs, which makes it easy even for sight reading for my older students. All series shows a lot of taste and respect to music material. Thanks,Jennifer! I have heard so many good things about Piano Pronto, that I wanted to purchase the Teacher Starter Pack in order to review it for myself. I am so excited that you are offering it for 50% off the original price. I can’t wait for it to arrive! Thank you for all you do for the piano community! I love using these books! I have thoroughly enjoyed using the books from the Teacher Starter Pack, and find that my students are equally excited about them. I have used many other method series in the past, but this one tops them all! And by purchasing the 12-book starter pack, I am equipped with material appropriate for all of my students’ ages and skill levels. This book combo is a beautiful addition to my piano literature library! Thank you, Jennifer–I am a big fan! I love this piano method series! Good Value with Good Price!